Food Trucks – Local foodies take their show on the road. The author’s husband, in his company’s new food truck. On a recent weekend away to Portland, Ore., one of several eating vacations I like to take each year, I was stunned to see so many food trucks – some 700 in all it seems. Balancing a Hawaiian plate lunch of kalua pork and cabbage with sticky rice while listening to buskers strum twangy guitars, I took in a scene of ravenous hordes descending upon dozens of trucks doling out epicurean creations at the famed Saturday Market. Of course, Ventura County doesn’t have anywhere near 700 food trucks, but with a handful of new trucks on the local scene and food truck festivals popping up around the county each month attracting local trucks as well as trucks from Los Angeles and Santa Barbara, the mobile eatery craze is definitely taking hold here. Even my husband Bill has found himself getting swept up in the craze, too, with his employer, Ewing Irrigation, recently debuting their own kitchen on wheels. Upon discovering Bill’s natural culinary talents (you guys might recall that though I’m a food writer, he’s the one who can actually cook), they tapped him recently to beta test their new stoves. 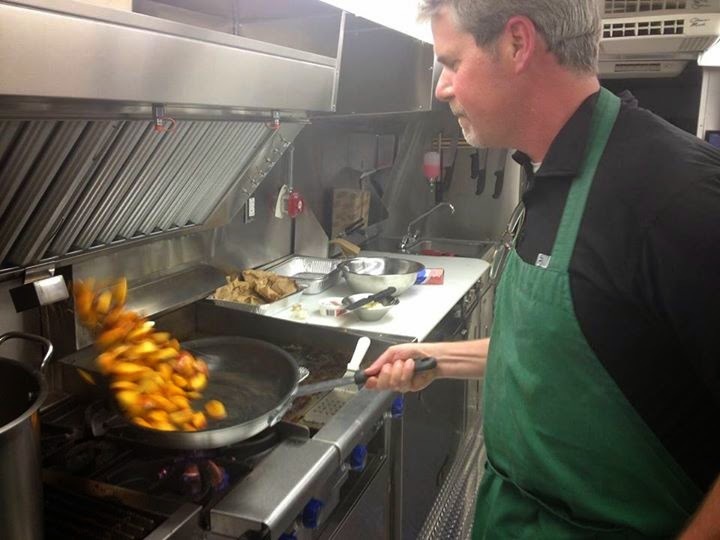 He won’t be leaving his day job as their So Cal regional manager anytime soon, but cooking in a commercial-grade kitchen sure fired him up. 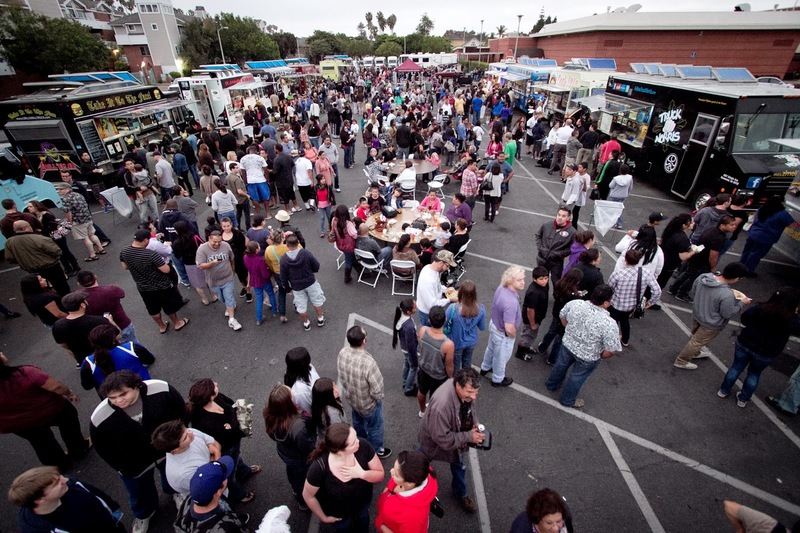 The longest running recurring food truck event in the 805 (since September 2011) boasts an average attendance of 1633 people at each monthly event. Featured trucks include the Grilled Cheese Truck (which usually has the longest line), Cousins Maine Lobster (don’t miss the lobster macaroni and cheese), White Rabbit’s Filipino Fusion and Oooh La La Crepes. This popular festival takes place the first Thursday of every month from 6-10 p.m. at Plaza Park at 500 South C Street. Set in Oxnard’s Channel Islands Harbor where they already have a vibrant restaurant scene, Wet Wednesdays boasts the only food truck event in the county at the water’s edge. Featured trucks include Sugar Babies, Border Grill and Me So Hungry (don’t miss the short rib sliders). Occurs the third Wednesday of every month from 5-9 p.m. at Marine Emporium Landing, 3600 S. Harbor Blvd. 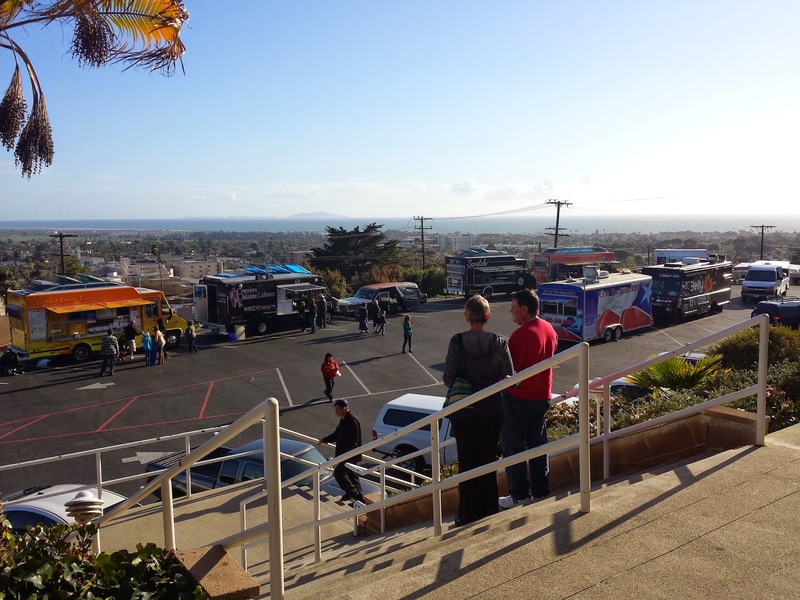 Touting the best views in the county, the Foothill Food Truck Fest was created as a fundraiser for the historic Poinsettia Pavilion. Local trucks are the main attraction here and include World Famous Franks, It’s in the Sauce, The Underground Gourmet and Desserts to Die For. Unlike other food truck events, you’ll also find local artisans selling handmade soaps, jams and jewelry, and they’ve got indoor seating and local wine and beer for sale, too. Occurs the first Tuesday of each month from 5-9 p.m. at Poinsettia Pavilion at 3451 Foothill Road. Billed as a family-friendly event, this festival in midtown Ventura includes The Cookie Scoop, Slammin’ Sliders and The Greasy Weiner. One of the newest trucks on the scene, Good to Go Juice, features organic local produce turned into freshly-squeezed juices and smoothies. Occurs the third Friday of every month, from 6-10 p.m. at the Pacific View Mall at 3301-1 E Main Street in the parking lot between Main and Telegraph, along Mills Road. Last year when the lease expired on his restaurant of 10 years in midtown Ventura, Chef Tim Kilcoyne decided to go mobile. His gourmet food truck features produce and meat from many of the same local farmers and ranchers who he already had relationships with from his Sidecar Restaurant days. The menu includes hand-formed burgers, smoked chicken tacos, coconut grilled chicken burritos and more, all prepared with creativity and sustainability in mind. Pork takes center stage here, though, and no one does pork better than Chef Tim, a classically trained culinary school graduate. He usually buys a whole hog from a small local rancher and finds unexpected ways to prepare it. The house-cured porkstrami with caraway mustard slaw and the smoked pork with peanut butter and strawberry jam sandwiches are game changers. Don’t miss the hand-cut fries with Kilcoyne’s own homemade ketchup. You can usually catch him at any of the food truck festivals mentioned in this article, but if you don’t want to make the short drive down the hill, you can almost always find him here in Ojai on Sunday mornings next to the farmers’ market. For more about his food and his schedule, visit www.scratchventura.com.